At my middle school and high school, students were allowed to take one period off in their schedule to be a Teacher’s Aide. While TAs in college were usually graduate students who would assist in teaching lab classes and take on other teaching duties, TAs in middle school and high school would do menial tasks like marking multiple choice tests based on an answer key or walk around collecting attendance sheets. While this isn’t the same sort small-time job as would be asked of a student doing a Samoan fe’au, the diminutive nature of the task is as close a parallel as I can find. The literal translation of fe’au is an “errand” or “something to be done”. Within the context of school, this usually means an errand a student is running for a teacher. At my school it’s not unusual for a teacher to pull aside a trusted student, hand that student $5, and have the student walk across the street to buy Digicel phone credit or a cup of Ramen noodles. Often when asking a student to fulfill such a task, a teacher will ball up the $5-bill and toss it in the student’s direction, and the student will pick it off the floor. Though fe’aus don’t always involve retail transactions, most involve moving a object from one place to another. Having a student do some heavy lifting or sending a message to another teacher via carrier student are both acceptable uses of fe’au; I’ve heard other volunteers talk about sending a student to retrieve items from the volunteer’s house. Rules also differ from place to place. 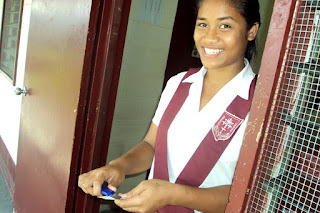 I heard from another volunteer that at his school, if a student is sent on a fe’au to buy phone credit, and the fale’oloa down the street is out , that student needs to keep walking until he finds phone credit. He’s essentially not allowed to return to school until the fe’au is completed. This mentality of not resting until the job is done is okay though because running a fe’au is a completely acceptable excuse for not showing up to class on time. I am fascinated by the fe’au phenomenon for 2 reasons. First, most tasks seem either too menial or too risky to warrant a student’s participation. I don’t feel justified in asking a student to carry a stack of books thirty meters when I could just as easily do it myself, and I’m always a little terrified some kid is going to get hit by a car crossing the street to buy me phone credit. My second fascination is choosing the student to run the fe’au. When I have a task in mind, I will think of a specific student and then seek out him or her. Whereas other teachers seem willing to trust any random kid to run an errand. I guess what I’m trying to say is I never could have implemented the fe’au system in Oakland Unified. I would have been fired for child endangerment, and I would have been out $5. 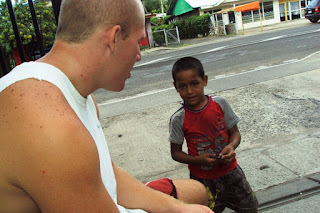 This kid approached Dan and me to sell us pens. We chatted with him. 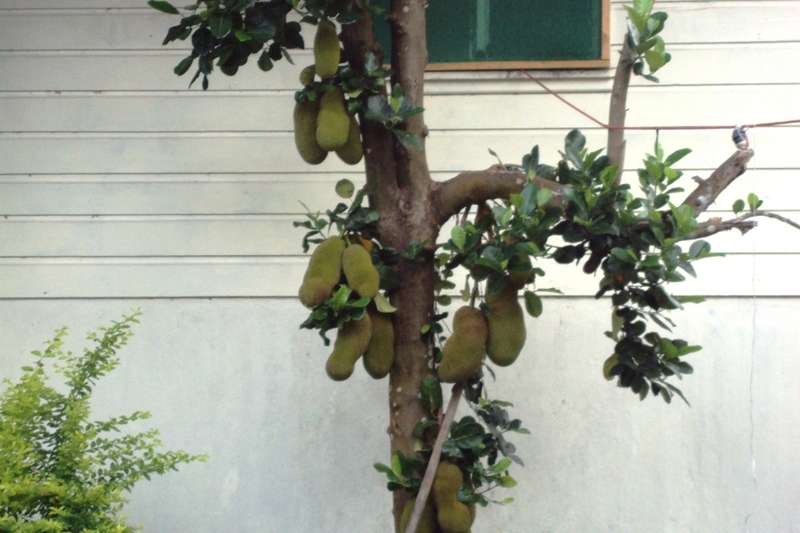 Jackfruit growing at Blakey's pule's house. 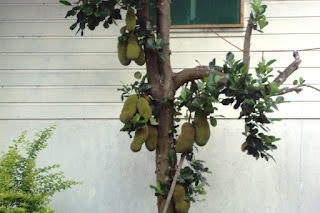 Jack fruit is very popular in South East Asia and very much edible. Is that a salapalapa, I've never figured out the word for it but thank you, now I know. It is, and very different, how Americans think and how Samoans are..Trust is everywhere! !